This lighted lamppost decoration is perfect for brightening your park, town square or city center this holiday season. This lamp post decoration is also perfect for larger estates and properties wanting to feature a wonderful holiday presentation. The decoration consists of lighted Holly leaves accent a poinsettia spray to enlighten the outdoor holiday spirit. 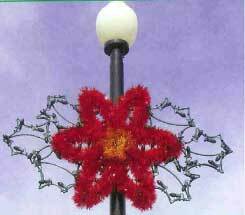 Need to outfit a street light or light pole, check out our pole mounted holiday decorations.